Are you ready for some serious photos of apple pie? My sister-in-law Meg is a major pie-lover and wanted me to show her how to make a pie. One Saturday she came over for a pie-a-thon while the boys did something boyish. We ended up with three apple pies, one for Meg, one for me and one for friends that had kindly given us apples from their apple tree. Our Saturday started with gray skies and a mist of rain. We stopped at the farmers market with the hoods on our coats up, looking for Michigan honey crisp apples and a hot drink from the nearby coffee and tea shop. I wanted three varieties of apples total for our pies and the honey crisp joined the apples gifted to us by friends that were small and tart and I also purchased a few organic Fuji apples because the first apple pie I ever made had Fuji apples in it. It’s kind of a tradition. We started with the crust. I know crust can be very scary for people of all baking levels and the only thing I can attribute my crust bravery to, is that my Mom always made her own crust. Her recipe is an oil pastry, which is good, but I prefer an all-butter crust for flakiness and flavor. I like using my food processor to minimize the amount of time the dough is worked and therefore keeping the crust tender and flaky, but I wanted to show Meg how to use a pastry blender, too. We started with one food processor crust and Meg dropped the cold cubes of butter into the dry ingredients and added ice water a few tablespoons at a time and pulsed until we had a dough that could easily be pinched between our fingers and no longer looked floury. Next, I showed her the same recipe, but this time she used a pastry blender to distribute the butter into the flour before adding ice water to the dough. Things get a little slippery with the pastry blender in a shiny bowl, so I put a damp towel under the bowl to stabilize it. We made a huge, wonderful mess. Crust three was Meg’s choice and she went with the food processor method because it comes together so quickly. 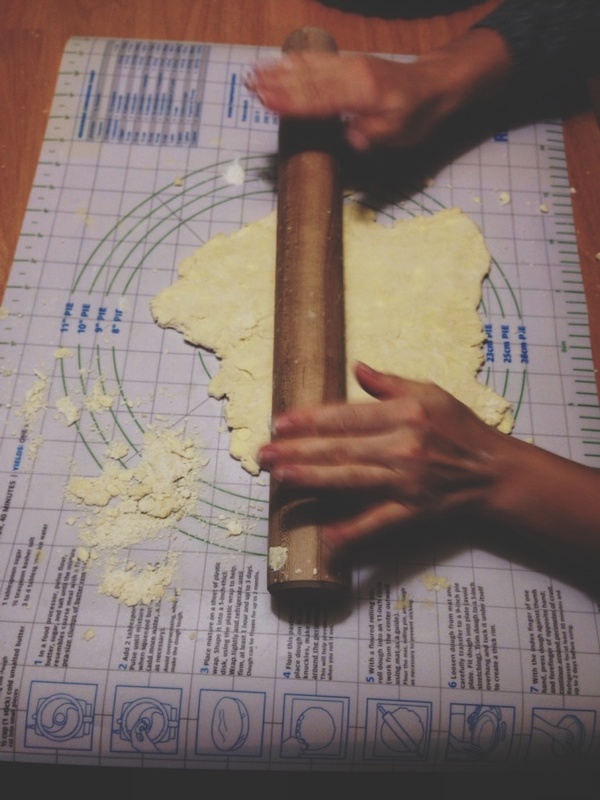 Meg brought along a silicone baking mat that came in handy when rolling out the dough for our three different pie pans and it also has measurements along the top and bottom which worked well when it came time to cut out the lattice strips. A pizza wheel also made creating the strips that much easier. Once you bring your dough together in a ball, roll once and then turn the dough a quarter turn and then roll again. By turning a quarter turn with each roll, it’s easier to keep rolling the dough in an even circle. Above is Meg’s first time rolling out the crust! After the first crust was ready, we rolled the crust on top of itself onto the rolling pin and gently unrolled it over the pie plate. Then added the apple filling and a few cubes of cold butter for flavor and to thicken the filling before putting it all back in the fridge to chill. A cold, relaxed crust yields a better crust that does not shrink. 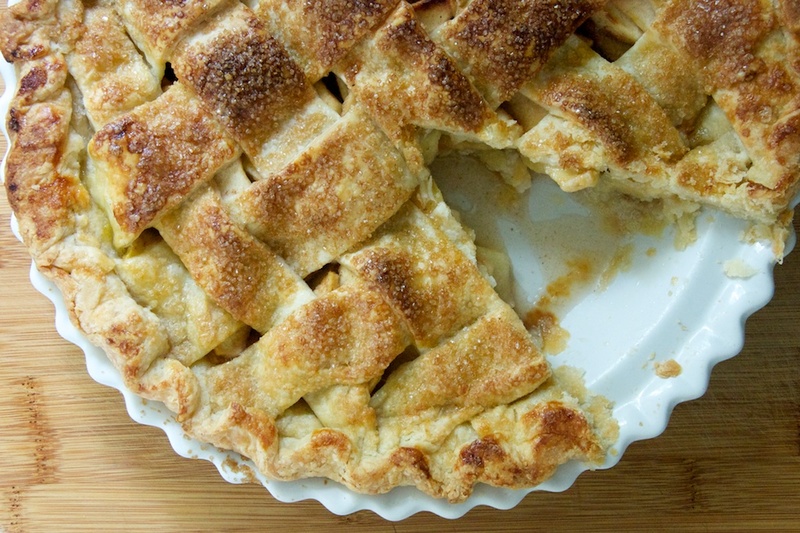 High-quality cinnamon and freshly grated nutmeg will really make a difference in your pie. I use Vietnamese extra-fancy ground cinnamon from Penzey’s. I would have loved to do a step-by-step on the lattice crust, but my hands were covered in butter and flour for most of the day. After creating the strips, I found it helpful to put down every other strip in one direction and then start going in the other direction with the leftover strips and to start weaving in the middle with the longest strip left. This is my first lattice crust and I was intimidated at first, but it turned out to be really easy and just so pretty. This pie plate has sentimental value as it was one of the first things Marc ever purchased for me. I still love it, but a glass pie plate is helpful so you can make sure your crust is fully cooked on the bottom. If you can see you need more baking time for the bottom of your crust, but your top crust is already golden brown, cover your pie completely in foil and cook in 15 minute increments. Let your pie cool completely before cutting in, because you need to give it to time to set up. 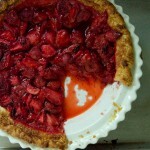 I cut into my pie the next afternoon and a little bit of juice from the filling pooled where the slice had been. I simply took a spoon and removed the excess juice and the rest of the pieces came out perfectly. Our pie session was really fun and we ended up with 3 beautiful pies.I know pie can be really intimidating, but I think confidence in the kitchen is so important for great results. You can do it! I used a mix of 3 kinds of apples, Fuji, Honey Crisp and a small tart apple from our friend’s tree. 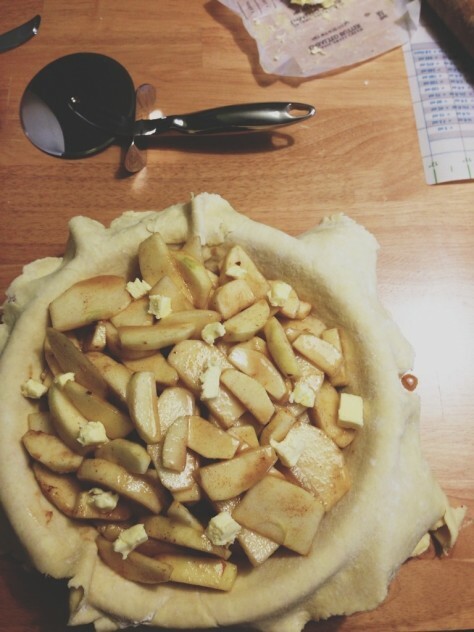 I think a variety of apples makes for more interesting flavor in the pie. If you prefer to use all tart apples like granny smith, you may want to increase the amount of sugar you use by 1/4-1/2 cup. A glass pie plate makes it easier to see how your crust is progressing. I used a thicker lattice of 1 1/2 inch strips because I like that look, but feel free to make your lattice strips 3/4 inch thick for a thinner, more traditional lattice. 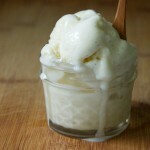 In a 1 or 2 cup measuring cup, fill with water and add an ice cube or two. Add 7 tablespoons of the ice water to the food processor and quickly pulse twice. The amount of water you need depends on temperature and type of flour, so start with 7 tablespoons and get a feel from there. Add two more tablespoons and pulse twice, again. Repeat until the mixture starts to pull from the sides of the food processor and is easily pinched between your fingers. Empty contents onto a large silicone mat or a lightly floured surface and using your hands, quickly form into a ball. Wrap in plastic wrap and put into the fridge to chill for at least an hour. Wash and dry apples. To peel, use a sharp knife to cut a small slice off the top and off the bottom of the apple. Use a vegetable/fruit peeler to peel the skin off vertically. If you have an apple slicer, put the peeled apple on a sturdy surface and line the slicer up with the circle over the core and press firmly down. Carefully release the slices and core. Discard the core and cut the slices into 2 or 3 thinner slices. Alternatively, you can cut away the apple from the core and slice those pieces into even, thin slices. Add freshly squeeze lemon juice to the apple slices and gently mix to keep the apple slices from turning brown. Add sugar, flour, cinnamon, nutmeg and a pinch of salt to the apple slices and gently mix, again. Set aside. You will add the butter later when filling the pie. Preheat oven to 400 degrees F. Remove cold pie dough from the fridge and using a bench scraper or sharp knife, cut in half. Wrap up one half and put it back in the fridge. Put the other half on a large silicone mat or on a lightly floured surface. 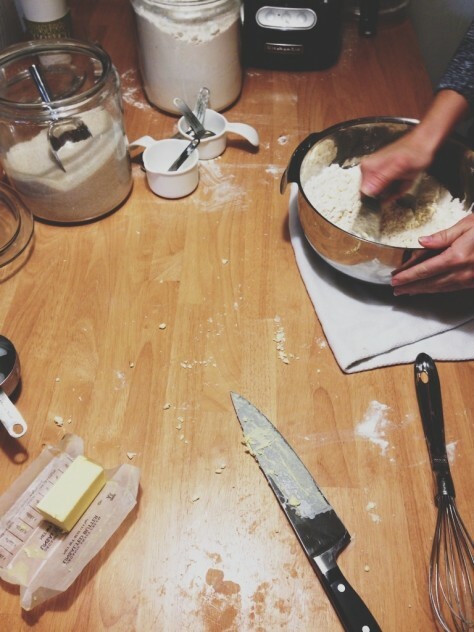 Using your hands, quickly form dough into a slightly flattened disk. Dust the dough with a little flour and rub flour onto your rolling pin. Roll the dough, turn the disk a quarter turn and roll again. Repeat, turning a quarter turn in between each roll to keep the dough in a circle. Roll until dough is about 1/8 inch thick. To transfer dough to your pie plate, roll dough loosely on top of itself onto your rolling pin and then gently unroll it onto your pie plate. Settle the dough into your pie plate, making sure the overhang is pretty even and prick the dough with a fork in several spots. Add the apple filling without any of the accumulated juices to the pie plate and dot the top of the apples with the cubes of cold butter. If there is a lot of crust over-hang, gently fold it in a bit so it isn’t dragging. Put the whole thing in the fridge to chill while you roll out the second pie crust. Remove the other half of the pie dough and repeat with the rolling instructions above. Using a ruler, mark 1 1/2 inch increments along the top and bottom of the dough. Use a pizza wheel to cut out the pie strips for a lattice top. Get pie plate from the fridge. Take every other strip of dough and place it on top of the pie with a half inch space in between each strip. Pull up every other strip and fold it onto itself, a little more than halfway. Take the longest strip left and place it under the strips you pulled up, but over the others. Lay the strips you pulled up back down onto the pie and pull up the strips that were not picked up before and place a new strip down. 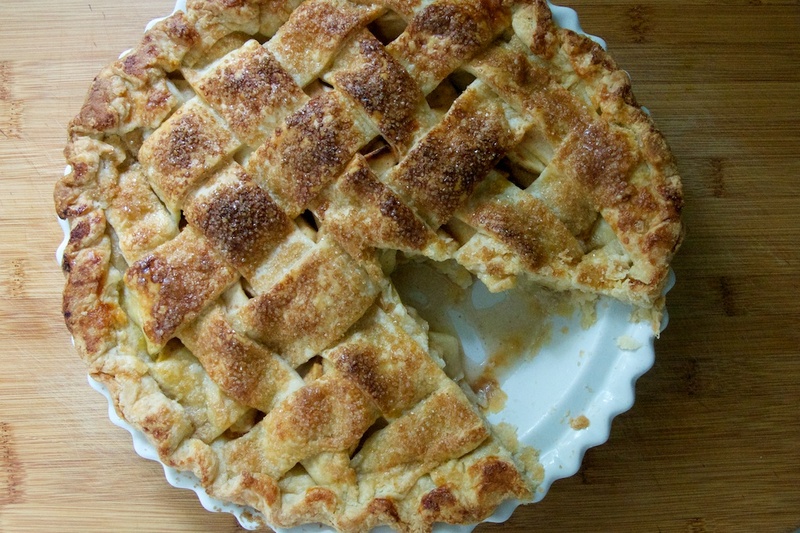 Continue until you have the whole pie covered with a lattice pattern. 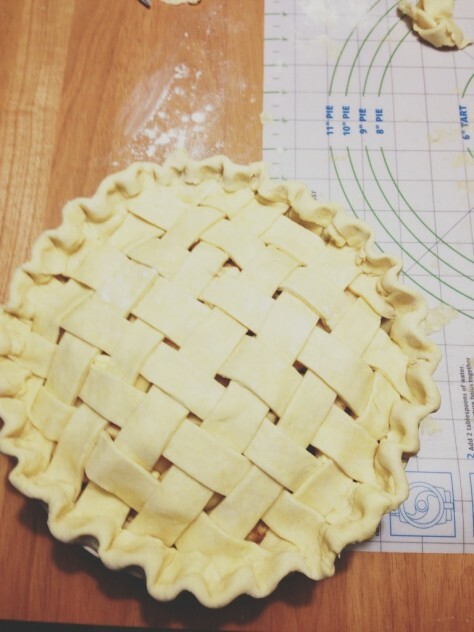 Cut excess pie dough and lattice ends, so that you have an inch of dough all around. You can borrow any excess dough to fill in any skimpy parts. Roll the one inch of excess pie dough inward as if you were rolling paper into a scroll until you have a nice ring of dough around the edge of your pie plate. Using your thumb and pointer from one hand in a pinching motion and your pointer knuckle from the other hand, make a pretty pinch pattern around the edge. With a pastry brush, lightly brush the beaten egg all over the lattice and on the decorative edge of the crust. 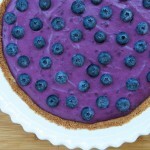 Using two tablespoons of turbinado sugar, shake the sugar evenly all over the crust. 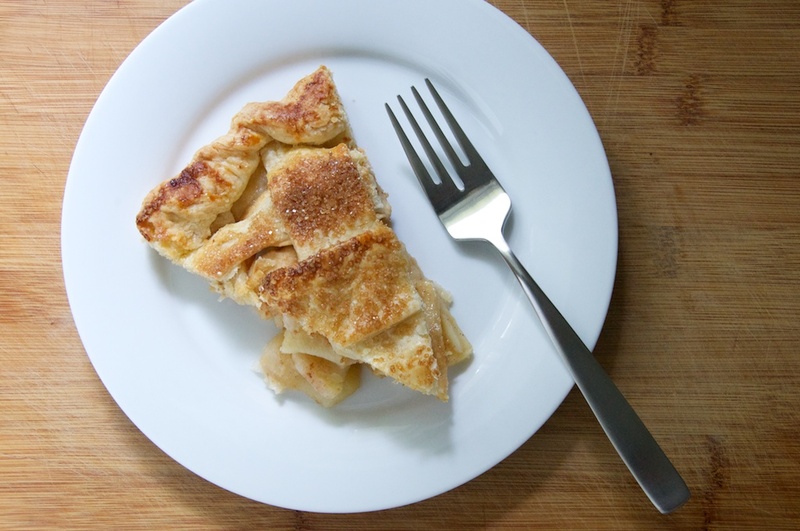 Use a silicone pie shield or cover pie with aluminum foil to cover pie, so it does not burn and place the pie plate on a rimmed baking sheet to catch any pie juices. Bake the pie at 400 degrees F for 20 minutes and then turn the oven down to 350 degrees F and bake for another 30 minutes. Remove the pie shield or foil and bake for another 25-30 minutes, a total of 1 hour and 20 minutes baking time. If at any time the top becomes too brown, you can cover the whole pie in aluminum foil and continue to bake. 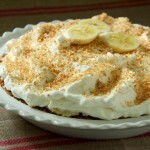 If you have a glass pie plate, check to make sure the bottom is cooked. Allow to cool completely before digging in. Thanks, Sues! You’re too kind! The vintage-looking ones were phone shots with VSCO edits. Glad you enjoyed them! 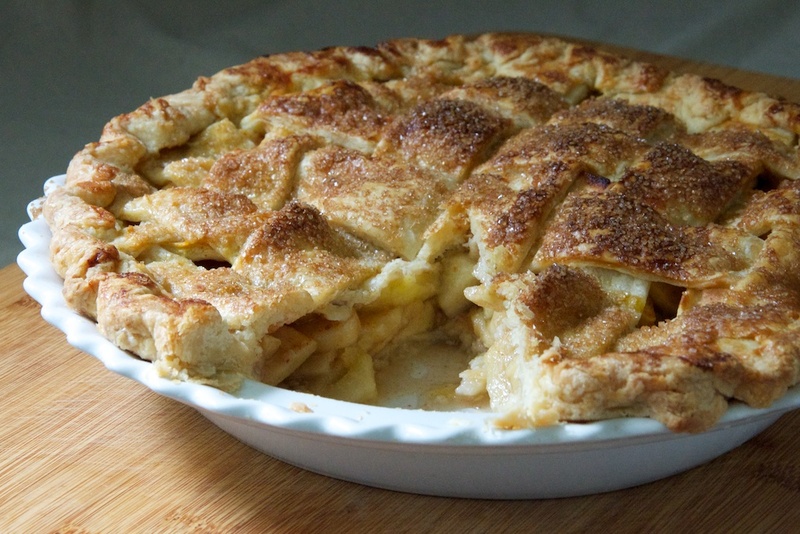 There really is nothing like a classic, homemade apple pie. I haven’t made one in a couple of years but I think I need to change that. Yours looks gorgeous! Thanks, Stephanie! I hadn’t made one in a few years, either. You’re right, there’s just nothing quite like a classic apple pie! an oldie but goodie! that is so beautiful, nicole! Thanks, Molly! The classic never get old, right? holy moly! this looks perfect! I totally agree that a mix of apples is where it’s at! great job with the lattice, too! Yes to apple mixing! Thanks, Cindy!